On October 1, 1977, more than 75,000 fans, including Muhammad Ali, packed into Giants Stadium and millions more tuned into ABC's "Wide World of Sports" to watch the final professional soccer match played by Edison Arantes do Nascimento. The 37-year-old Brazilian, known to the world as Pelé, spent the first 45 minutes in a Cosmos uniform—scoring a free kick minutes before the referee blew his whistle—and the second half wearing the jersey of the only other club he ever played for, São Paulo's Santos. That match was the peak of soccer in America, a demonstration of what the sport could be in a country that never much cared for it. But the popularity of the Cosmos also created an impossible standard for future leagues, a one-off opportunity that could never be competed with, much less topped.1 More than 35 years later, soccer struggles to gain a foothold in the greater American sporting consciousness, and the success of the team Pelé built continues to hurt the prospects of Major League Soccer (MLS) and the sport in the United States because it dramatically and unfairly altered the perception of what success should look like. 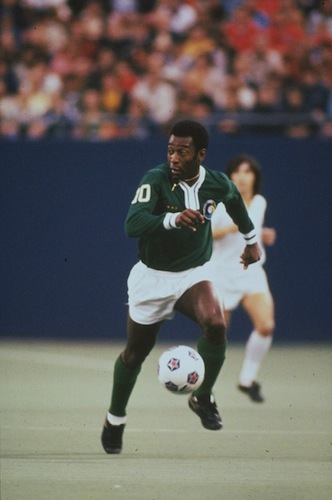 In many ways, the completeness with which Pelé, the Cosmos, and the rest of the North American Soccer League (NASL) captured the imagination of the country during the late 1970s was the best thing to happen to soccer in the United States. In other regards, however, it was the worst. MLS, which begins its eighteenth season on March 2, is a viable, growing league. Attendance averaged nearly 19,000 fans a game in 2012, the highest ever, a figure that placed it behind the NFL and Major League Baseball, but ahead of the NHL and the NBA. After running into serious financial trouble in the early 2000s, the league is sustainable and economically viable, charging a potential $100 million expansion fee for a second New York franchise, which would be the league's 20th squad. The quality of play improves every year, and while it couldn't compete with the English Premier League, Spain's La Liga, or any of the other top divisions in Europe, it is catching up to Mexico's older, richer Liga MX and already tops some of Europe's lesser leagues. MLS executives say they want to be among the best in the world by 2022, an ambitious, probably unachievable goal—2030 or 2040 is more likely, if ever—but they have no shortage of ambition. Progress toward that end is steady, if slow. But the casual American sports fan does not appreciate how far MLS has come from its hardscrabble beginnings, and the Cosmos are at least partly to blame. During their run in the late 1970s, the glamorous New York team employed not only Pelé, but his countryman Carlos Alberto, German star Franz Beckenbauer (widely considered that country's greatest player, ever), outgoing Italian egomaniac Giorgio Chinaglia, and the charismatic, Bronx-born goalkeeper Shep Messing. They were the first team of global superstars that America had ever seen, a club that played fast and loose on the field, endearing themselves to audiences across the country. Mick Jagger, Robert Redford, Barbra Streisand, and other celebrities sought access to the locker room or post-game parties at Studio 54. People went to a cultural event and a soccer game broke out. In an era when cool was all that mattered, the Cosmos cornered the market. Pelé during the Cosmos' peak. They also spent millions, funded by owner Warner Communications. Pelé was paid an outrageous $1.4 million per season. (The 2013 MLS salary cap is less that $3 million per team.) The rest of the NASL followed suit and spent unsustainably, recruiting players like Johan Cruyff, George Best, and Javier Aguirre. While the Cosmos were winning on the field, following up a championship in 1977 with one in 1978, when attendance peaked at almost 48,000 per game, the league was crumbling behind the scenes. "It was impossible to keep it going at the Cosmos level," Clive Toye, the general manager who signed Pelé, told me. Although the NASL wouldn't fold for another half decade, interest in the league was fading as no player could replace the magnetism and star power of the retired Brazilian. Rapid expansion spread talent too thin, and teams folded as owners failed to control rising salaries. The luster of the Cosmos began to tarnish, as did that of the rest of the NASL. Fans wanted to remember the good times, not the bad. New soccer fans had nowhere to turn. "When the Cosmos folded, it was absolutely devastating. I was 16 years old and my dreams of being a professional soccer player vanished. Playing in college was not the dream," David Kilpatrick, a Mercy College professor and the Cosmos club historian, said. The team disappeared into the collective memory of the masses. So did soccer itself. Sure, some former NASL fans followed the fledging Major Indoor Soccer League or the American Soccer League, but for the most part Americans forgot about the sport. When Major League Soccer started in 1996, it promised none of the flash of the Cosmos. Executives structured the league to avoid the monetary excesses that doomed the NASL—a smart business model, but one that didn't allow for Cosmos-era talent or excitement. If you remembered those 70,000 soccer fans in Giants Stadium, and seeing some of the game's all-time greats (albeit in the twilight of their careers), how could you be impressed by the likes of Columbus Crew's Brian McBride playing before 19,000 fans in the 90,000-capacity Ohio Stadium? Even the Los Angeles Galaxy, who averaged a league-high 28,900 fans in 1996, played in a 70-percent-empty Rose Bowl. When Once in a Lifetime, a documentary about the success and excess of the Cosmos, premiered in 2006, it only reinforced the gap between the dream team of the '70s and the MLS. While the domestic league's attendance has ticked up each of the past three seasons, bolstered by smart expansion into regions with rabid fan support and the construction of soccer-specific stadiums that improve the spectator experience, it still can't touch the fascination with the Cosmos and the NASL. This year, 19 teams will compete for MLS Cup, won the past two seasons by the Galaxy, who will be without the closest thing the league ever had to Pelé: England's David Beckham, now with Paris Saint-Germain. MLS and Galaxy brass no doubt hoped the handsome international star would make a Pelé-sized splash when they signed him in 2007 to a five-year, $32.5 million deal. He did at first. Some 250,000 Galaxy jerseys were sold before he'd even been officially introduced. His Galaxy debut, in an international friendly against Chelsea, drew the likes of Tom Cruise, Katie Holmes, Eva Longoria, Mary-Kate Olsen, and Governor Arnold Schwarzenegger; and 66,000 people turned out to Giants Stadium to see his first MLS start, against the Red Bulls. But TV ratings remained disappointing, and the buzz faded quickly. While he no doubt raised the profile of the league, both in the U.S. and abroad, and performed well enough (when he wasn't injured or on loan to a European club), Beckham couldn't possibly replicate the impact of the Brazilian. The sporting and cultural landscape has become too fractured. In the U.S., MLS has to compete for attention with European leagues that are widely available via cable TV and online streams, plus all the major domestic sports. In 2013, it's simply not possible for a soccer player—or perhaps any athlete, in any sport—to capture our collective attention the way Pelé and the Comsos did. Still, MLS continues to chug along. Most likely, the level of play will grow incrementally, fan support will improve another few percentage points, and the year will be a minor success on a long road to becoming one of the world's best leagues. In August, meanwhile, the new New York Cosmos will formally return to the field—with Pelé as their honorary president—after an absence of three and a half decades. They will play in the new NASL, a lower-division league that was founded in 2009 and began play in 2011; Hofstra University's 15,000-person stadium will be their home field. The Cosmos may even end up being that second New York franchise the MLS has been seeking. The club's new owners, who bought the name in 2011, are first trying to find a sustainable business model, short on the glitz but in the black. It's how soccer in the U.S. should look. It's how soccer in the U.S. should have always looked. The team was called the New York Cosmos for most of its existence, but dropped "New York" from its name for the 1977 and 1978 seasons.